LYDIE BREEZE: AIPOTU, EgoPo Classic Theater at Christ Church Neighborhood House, 20 N. American Street, Philadelphia, through March 18 but returning in April as part of a Marathon — Mirror-read the title, and you’ll see it spells Utopia. John Guare’s is a lot less pristine, tidy, or effective as Thomas More’s. Or even the neighboring solo outing by Henry David Thoreau, a point made by Lydie Breeze, and she and her three fellow survivors from Civll War horrors decide to create an ideal community on her home island of Nantucket. Lydie, the focal character in a Guare trilogy EgoPo mounts this spring, makes her Thoreau comparison caustically. She doesn’t point out the fabled Walden Pond denizen is alone and therefore can commune with nature and not humans who have their own natures, wishes, and feet, but that Thoreau has family money and can afford his experiment of eccentricity, as they case may be. Guare’s trilogy is about a usually untended period from the Civil War to the top of the 20th century. It solows Lydie Breeze as she strives to remain a survivor in spite of hardship, less committed partners, and stepping on her own dreams. Lydie proves resourceful as battlefield nurse who takes matter into her own hands in “Cold Harbor,” Guare’s first entry in his triptych. “Aipotu” finds her more at odds with her cohorts, some of them rivals for her sexual attention, and with reality. As often happens with Guare, who I prefer to trust for his best moments than to dismiss for his muddier or preachier passages, sequences of insight and interesting commentary alternate with dull portions and cant. Director Lane Savadove has been skillful in steering a course that keeps his two “Lydie Breeze” productions so far absorbing enough in the provoking scenes to earn confidence that lets us endure Guare’s labored or less wise bits. “Aipotu” is a prime example of an adventure in Guareland. Its long first act sets up a situation, a good one in which Guare shows in myriad ways why and how Utopias are best left theoretical, even an historic period when they are in vogue, and Lydie and company are sincere about developing one. The problem is the myriad ways, all tied to human nature, fold in on themselves. You have Guare’s point, then he repeats it. Some exposition becomes tedious as it’s either rehashed or told when it could be more efficiently, and more theatrically, shown. Arguments and tensions seem endless, but not in a way that creates suspense or evokes feelings for the characters. They stay distant and like archetypes standing for competing points of view rather than people struggling through a mutually-decided mutual effort. This, in spite of excellent acting from Savadove’s nuclear players — Charlie DelMarcelle, David Girard, Ed Swidey, and the evolvingly remarkable Melanie Julian. The second act is the opposite. Relatively compact at 40 minutes, this ending becomes a fitting and riveting aftermath that suggest that two of the Nirvana-seeking quartet find their Utopias in places least expected, the lucrative practice of law and a prison cell. Guare and Savadove find virtue in economy. (Keep your cracks to yourself, please.) The second part of “Aipotu” is the most riveting part of the trilogy to date. Given the competition it had from sequences from “Cold Harbor,” that is meant to say a lot. As a disdainer of Utopias and rigid conceptual theories of how the world should work, a trait that has made me a stranger to my generation since the ’60 sand leaves me politically disgusted and totally uncommitted to anything any side bruits today — A plague on all stupidly built houses, I say. — I am pleased with Guare bursting the Utopian bubble. Lydie and her group are aware that it will hard part to achieve their designed paradise, and to attract like-minded people to it, but Guare doesn’t dwell on that difficulty, he delves into how the ideal is split from the inside, particularly when those pesky things like human nature, individuality, fundamental disagreement, independence, and unequal distribution, or least assumption, of labor set in. In “Aipotu,” romantic conflict doesn’t help either. DelMarcelle’s Joshua Hickman, and Girard’s Dan Grady, both craving Lydie, now Josh’s wife, and Lydie’s libido leaning in two directions and but listing decided towards the adulterous one, work at much as anything to obliterate common ground (by staking common ground) and create conflict that mitigates the cooperation and consensus required to realize a commune. Though at time repeating a point or beating around the bush, Guare illustrates — showing, not telling; hooray for old school — how the best laid plans burst when genuine conditions and inflexible human intentions aren’t as pure or exact as the perfection possible in conceiving an ideal world on paper. Embryos develop. They become more complex. Reality always encroaches. It encroaches harder when you’re not prepared for it, ignore it, can’t adjust to it, or stick firmly to guns that are too rusted and calcified to shoot. The history of the world, and the world’s best literature, tell over and over again how the ideal shatters and the causes of the shattering. You have to go no further than the French Revolution to see it clearly. People, with their own desires and interests, are not fit for Utopia. Just look at religion, allegedly a respite from the cares and politics of the world. One ancient religion has one side throwing rocks at another for having its own mind about whether to drive on a given day or go sleeveless, another has schisms that don’t heel and cause several different policies to reign under one umbrella, a third pits once sect mortally against another with twains not even wanting to meet, a fourth creates social castes that demolish the possibility for unity and communal action. If the holy can’t keep their hands off of torches and pitchforks, what hope is there for the rest of us? So Lydie Breeze’s plan of a perfect society is doomed by the constant way of the world. Guare, dwelling on one isolated group, destroys to Utopian. I believe his intention is we be sad about an impossible Utopia. To me, “Aipotu” is a warning about why Utopia is ill-fated, period. Yet, as I mentioned, in the second, two of Ludie’s original band, her husband and Swidey’s restless Amos Mason (whose first and last names near being anagrams), find inner peace and personal contentment in a way they could never achieve in their Nantucket Aipotu. Joshua commits a crime of passion and is relegated to life in a Massachusetts prison. His cell is the space he needs for his Utopia. He can read and think or talk about things that interest him without anyone caring enough to contradict because if Josh gets overbearing, a warder can send him to his cell and lock him up. Josh finds such imprisonment freeing. In jail, he can even fulfill his personal mission to teach literacy to fellow cons. Amos, who causes a rift when he announces his intention to leave Aipotu and act on an acceptance to Harvard Law, become a New York oligarch and is happy in his role. His main source of discontent is not being able to use his money to help Josh or Lydie, estranged by Josh’s crime, find their happiness. Of course, in Josh’s case, that would mean a lawyer’s idea of conventional happiness, as Amos has, rather than the obvious joy DelMarcelle conveys Joshua deriving from jail. The thought “Aipotu” provokes might be more interesting than the play, but Savadove keeps things moving, and parts that require slogging are worth enduring for the parts that show the best of Guare, his knowledge of the world and how to express the same theatrically. Melanie Julian shows mighty range from the plucky optimist to goes to help soldiers in “Cold Harbor,” the more seasoned woman who wants to act on what she thinks is more practical idealism in Aipotu, the Lydie disillusioned with the men who were supposed to her forge her quest, especially the absent Dan who returns to Aipotu rich but through thievery, and the embittered mature woman no one seems able to emotionally reach in “Aipotu’s” second act. Julian’s Lydie is interesting because you often admire her, and in “Cold Harbor” mostly like her, but Julian lets you see several sides of Lydie. She grows into them. Julian has collected Lydie’s experience, and instead of playing scene by scene, or period by period of Lydie’s life, as if each portion was isolated, this actress expresses the amalgam. It’s a treat to watch as she does it. David Girard brings by-then needed spark and variety to the first act of “Aipotu.” He has been a stand-out in Savadove’s effort to make Guare’s trilogy imporrant. 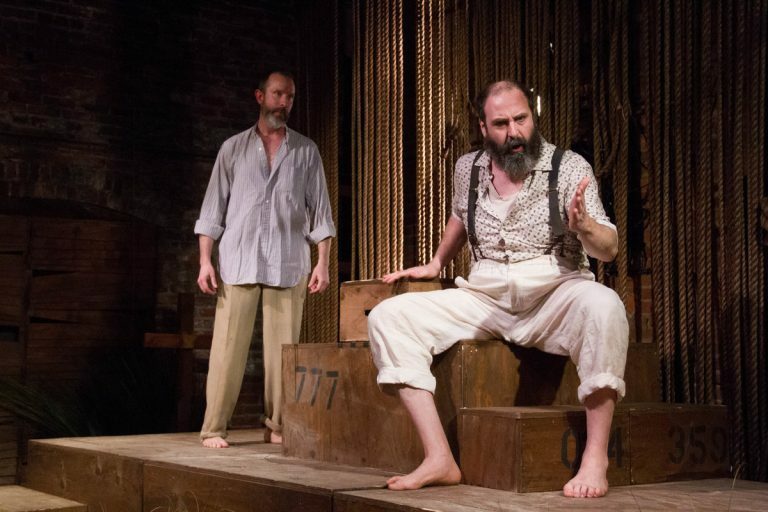 Charlie DelMarcelle finds the frustration in Act One’s Josh, and the inner peace and ironic bliss of his Act Two imprisonment. Ed Swidey’s oligarch of Act Two contrasts beautifully with the callow, stubborn, oversized baby we see in Act One. Mark Knight, as always, brings wit and classical tone, to his second act role as a relaxed prison guard who favors Joshua as someone with whom he can have a decent conversation. This entry was posted on March 24, 2018 by nzoren in Theater Reviews and tagged Aipotu, Amanda Jill Robinson, Andrew Carroll, Charlie DelMarcelle, Christ Church Neighborhood House, David Girard, drama, Ed Swidey, EgoPo Classic Theater, John Guare, Kristy Joe Slough, Kylie Westerbeck, Lane Savadove, Lydie Breeze trilogy, Mark Knight, Melanie Julian, Philadelphia Theater.